The ViewSonic VA1917a is a widescreen monitor that delivers value and performance for both home offices and small businesses. Featuring a matte finish design, this 19" monitor can fit on almost any desktop. Great for viewing office documents or surfing the web. Features a 19" widescreen, flat-panel display. 600:1 typical contrast ratio enables great color reproduction. 1366 x 768 maximum resolution for a high level of picture detail and a clear, bold display. 13.7" x 17.4" x 4.3"
Equipped with a 16:9 aspect ratio and 1366x768 native resolution, this monitor is designed for multitasking and improving productivity in the workplace or at home. This monitor delivers vivid and accurate colors with 100% color reproduction. This monitor features a 100 x 100mm VESA-mountable design that allows you to mount the monitor depending on your specific needs. You can easily unscrew the base, and then mount the monitor on its new stand or wall mount. 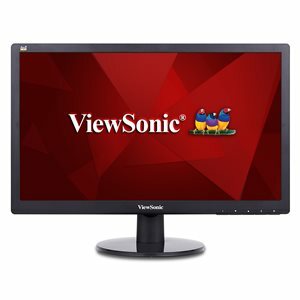 The ViewSonic VA1917a is a widescreen monitor that delivers value and performance for both home offices and small businesses. Featuring a matte finish design, this 19” monitor can fit on any desktop. Great for viewing office documents or surfing the web, the VA1917a is also equipped with crisp 1366x768 resolution, a fast 5ms response time, and rich color performance. The monitor’s built-in color management ensures the most accurate white level for image rendering, allowing users to match different color temperature settings to create more comfortable working conditions. In addition, energy-saving Eco-mode reduces cost of ownership, making the VA1917a the best choice for both government and education customers as well.